(Release Date: July 7, 2015 as a Best Buy Exclusive; September 8 at all retailers)  It is October 31, 2013 in the Arkansas-Texas border town of Texarkana, and 17-year-old sweethearts Jami (Addison Timlin) and Corey (Spencer Treat Clark) sit at the Twin Star Drive-In watching a screening of the community's cinematic claim to fame, Charles B. 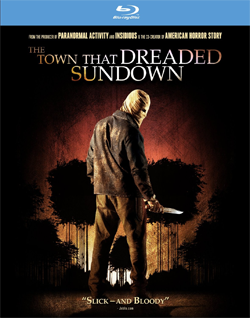 Pierce's fact-based 1976 horror picture "The Town That Dreaded Sundown." In the spring of 1946, Texarkana was rocked by a series of brutal slayings"The Moonlight Murders," as they were branded by the papersthat stopped as suddenly as they started. No one was ever apprehended for the crimes, but the fictionalized film depicting this case has brought a certain abiding infamy to this sleepy Midwestern burg. As the local church led by Reverend Cartwright (Edward Herrmann) hands out flyers to the attendees warning them of the sin of watching such filth, Jami and Corey decide to skip out early for some alone time. They park at a lovers' lane much like the ones where the so-called "Phantom Killer" struck all those decades ago, their existence within the present day reassuring them that nothing bad could possibly happen. Within minutes, their presumptions about safety will be irrevocably shattered, and Jami will be the sole survivor of a brutal attack perpetrated by a masked figure with a very sharp implement. The extended opening set-piece of 2014's "The Town That Dreaded Sundown" is a vicious, auspicious attention-grabber, the first sign that this inventive meta-remake-sequel amalgamation will be a step above the average modern horror redux. The second sign, running simultaneously with the multilayered story's ingenious conception, is Alfonso Gomez-Rejon's (TV's "American Horror Story" and "Glee") shrewdly taut direction and Michael Goi's exceptionally inspired cinematography. Gomez-Rejon, Goi and screenwriter Roberto Aguirre-Sacasa (2013's "Carrie") bring mood-saturated texture to settings and surroundings that are at once grizzled, idyllic and backward, snapshots of an Americana virtually frozen in time. The immersion with which Goi brings to his frame, opening with a lengthy tracking shot that immediately places the viewer in the center of Texarkana's city limits, should not be discounted. His work here and for the film's duration gives a gritty plausibility to his locationsperfect for a narrative that wavers between reality and fiction. Though Jami escapes with her life, she is left achingly vulnerable and all the more strong because of the past tragedies she has had to face. As a little girl, she witnessed her parents' deaths in a violent car accident, and since then has been cared for by her grandma, Lillian (Veronica Cartwright). When Corey is cruelly struck down while trying to protect her, her immediate focus shifts toward trying to solve Texarkana's prevailing mystery as a means of getting to the bottom of the current rash of killings. Jami suspects there is a connection, and archive employee Nick (Travis Tope) is willingperhaps too willingto help her. Set in a embellished but not entirely inaccurate version of Texarkana where the original horrific docudrama exists, "The Town That Dreaded Sundown" provocatively explores not only the 1946 murders and the making of Pierce's film, but also a "what-if?" scenario wherein the populace is once again held in the thralls of terror over a phantom. Candlelight vigils are held where Jami is left to feel more alone than ever, while snap judgments are made by the dual mayors (Lance E. Nichols and Geraldine Singer) as fear-mongering sweeps across the city. Lone Wolf Morales (Anthony Anderson) arrives to assist the police force, and first on his to-do list is to throw a copy of "The Town That Dreaded Sundown" into the station's archaic VCR. The director's loner son, Charles B. Pierce Jr. (Denis O'Hare), is tracked down living on the outskirts of town in a boat among the sand dunes, and fills Jami and Nick in on his theories of who he thinks might be involved. Meanwhile, residents who try to carry on with life as usual find themselves in situations perilously familiar to both the true crimes and the movie's fudged version of events (yes, a trombone figures into the gory proceedings). An ensemble piece with a central protagonist in the reserved but willful Jami, it is Addison Timlin (2014's "Odd Thomas") who carries the film with a performance of unassuming, underplayed star quality. Jami's troubled backstory and her struggles to make peace with what has happened is informed gradually and naturally as Timlin embodies the part of a responsible, intelligent teenage girl who isn't convinced that she will ever be able to escape the pall of death that continues to follow her around. As Nick, Travis Tope (2014's "Men, Woman and Children") plays things close to the vest, a guy who has liked Jami from afar but who may have an ulterior reason for getting close to her. Spencer Treat Clark (2013's "The Last Exorcism Part II"), however, makes a deeper impression in his brief early scenes as Jami's boyfriend, Corey, his grim fate hanging over all that follows. It is also great to see character actors like Veronica Cartwright (2007's "The Invasion"), Edward Herrmann (2011's "Bucky Larson: Born to Be a Star"), Gary Cole (2014's "Tammy"), Joshua Leonard (2014's "If I Stay") and Denis O'Hare (2013's "Dallas Buyers Club") pop up in supporting roles that are a touch richer than what is usually seen in stalk-and-slash fare. Of course, there is a lot more to the script than stalking and slashing, and it is because of this that the murder sequences have such a chilling impact. Kudos to Gomez-Rejon and Aguirre-Sacasa for introducing two instantly sympathetic male victims, Johnny (Jaren Mitchell) and Roy (Kurt Krause), who are treated no differently than if they were a straight couple. This may not sound like a big deal, but with the exception of the rare gay-centric horror film like 2005's "Hellbent," homosexuality within this genre has rarely been handled with such refreshingly laid-back honesty. The climactic confrontation between Jami and the enigmatic madman begins with a harrowing punch to the gut and a tension-filled chase down Main Street, but unfortunately devolves into one of those disappointing payoffs where the mystery psycho is unveiled and feels the need to explain his or her motives. The "Scream" series cornered the market on this formula and did it well. By comparison, "The Town That Dreaded Sundown" deserves a revised third act that could have found a way around this tedious trope. It would be enlightening to see how the original ending (of which there was one) might have changed, bettered or weakened the theatrical cut. For now, the film loses its way for a brief five-minute segment, but otherwise exceeds expectations with the level of punchy skill and irreverence accorded by director Alfonso Gomez-Rejon. Regardless of the identical title, "The Town That Dreaded Sundown" isn't some pointless Xerox copy of its '76 predecessor, but a dynamic, atmospherically shot thriller with a perceptive knack for time, place and methodically mounting unease. "The Town That Dreaded Sundown" is an inherently moody horror-mystery, and the 1080p presentation fully lives up to its atmospheric intentions. Shot with the Sony F-55 digital camera, the film has a rich aesthetic palette. Blacks are deep and inky with no sign of crush, while the dusty and woodsy rural backdrops favor greens, browns, and sunlight gold. Meanwhile, generous splashes of red are effectively awash in crimson radiance. In addition, the image is nicely detailed and technical anomalies are minor to nonexistent. Some shots are softer than others, but this is true to source and a result of the overall dark leanings of the visuals. The 5.1 DTS-HD Master Audio is as chilling as the film itself, bloodcurdling screams, piercing sound effects and the eerie music score traveling robustly across all home theater channels. Dialogue is always clearly defined. It would have been all too easy for the makers of "The Town That Dreaded Sundown" to unimaginatively copycat the 1976 original, but instead director Alfonso Gomez-Rejon, screenwriter Roberto Aguirre-Sacasa, and producers Jason Blum and Ryan Murphy have endeavored to put an inventive spin on the story, which simultaneously works as a remake, a sequel, and a meta-comment on the nearly 70-year-old real-life crimes that Texarkana has never been able to shake. It is disappointing that there are no substantive bonus features delving into the making of this underrated thriller, but Image Entertainment's Blu-ray release is worth seeking out for the film itself. That it provides exceptional high-def video and lossless audio is the blood-spattered cherry on top. Highly recommended.